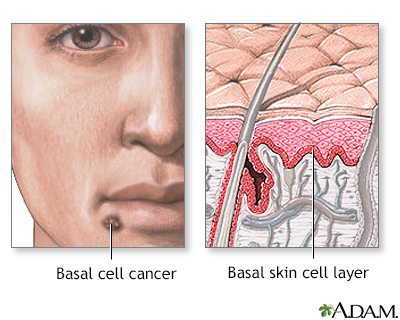 Basal cell cancer is the most common form of cancer in the United States. Most skin cancers are basal cell cancer. The top layer of the skin is called the epidermis. The bottom layer of the epidermis is the basal cell layer. With basal cancer, cells in this layer are the ones that become cancerous. Most basal cell cancers occur on skin that is regularly exposed to sunlight or other ultraviolet radiation. This type of skin cancer is most common in people over age 40. But it can also occur in younger people who have had extensive sun exposure. Basal cell cancer is almost always slow-growing. It rarely spreads to other parts of the body. In some cases, the skin is just slightly raised, or even flat. A skin biopsy must be done to confirm basal cell cancer or other skin cancers. Treatment depends on the size, depth, and location of the skin cancer and your overall health. Each treatment has its risks and benefits. You and your doctor can discuss the treatment that's right for you. Most of these cancers are cured when treated early. Some basal cell cancers return in the same location. Smaller ones are less likely to come back. 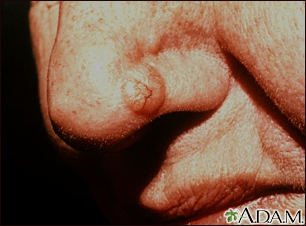 Basal cell skin cancer almost never spreads beyond the original location. Left untreated, however, it may spread into surrounding areas and nearby tissues and bone. Also call your provider if a spot becomes painful or swollen, or if it starts to bleed or itch. The American Cancer Society recommends that a provider examine your skin every year if you are older than 40 and every 3 years if you are 20 to 40 years old. You should also examine your own skin once a month. Use a hand mirror for hard-to-see places. Call your doctor if you notice anything unusual. Ultraviolet light is most intense between 10 a.m. and 4 p.m. Try to avoid the sun during these hours.